A favorite Middle Eastern ingredient, cooking teacher Elana Horwich makes cooking with roses approachable. Roses not only taste like love, they deliver the benefits of love too! What woman doesn’t want that? 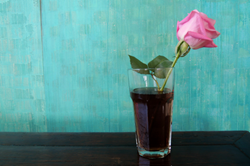 Meal and a Spiel announces 6 recipes and photos made with roses and rose water. Middle Eastern cuisine has utilized the intoxicating flavor of the rose since the Middle Ages, though it is widely unknown in western culture. Roses are considered to be anti-inflammatory, soothing to the nervous system and even an anti-depressant. “Roses not only taste like love, they deliver the benefits of love too! What woman doesn’t want that?” asks Elana Horwich, founder of the Meal and a Spiel cooking school. These photographed recipes, all of which are gluten free, range from simple morning tea to more elaborate dinners: Risotto with Rosewater and Saffron, Juicy Spiced Chicken with Hazelnuts, Honey and Rosewater, Rose Tea, Rose Hot Chocolate (Dairy and Sugar Free), Rose Meringues and Watermelon Rose Granita. Some recipes are adaptations from cooking greats such as Yotam Ottolenghi, while others are inspirations by Horwich herself. All photos are recently taken by Horwich and are available for use with permission. “All of my girlfriends wanted to know how I made my rose tea, and so I decided to design a series of recipes that would inspire western women to start cooking with roses!” says Horwich. Meal and a Spiel is a cooking school with a cult following in Beverly Hills. It provides an online resource of recipes, videos, and health information that successfully teaches "the career girl generations" to cook with passion. The spiels are written to allow cooks to enter into the recipe viscerally, from the heart and body, and not only from the mind. Founded in 2010 by former high school history teacher, world traveler and comedienne Elana Horwich who learned to cook while living in Italy, Meal and a Spiel believes in the power to transform the world one love-filled meal at a time. Please visit MealandaSpiel.com.